Nov - 05 | By: Oregon Film | no comments. 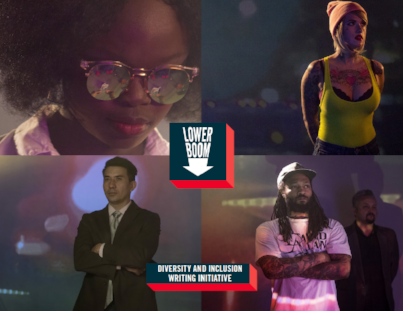 The #OregonMade Creative Foundation and Comcast are proud to be supporters of Lower Boom’s Diversity and Inclusion Writing Initiative. This project is focused on giving diverse and historically disenfranchised writers an opportunity to write for TV. Currently, six writers are gathering on a weekly basis to work on the pilot and series script for an original, home grown prestige drama, Portland Dark. On October 20th, Lower Boom held a gathering looking to raise both awareness and funding in support of Lower Boom’s Diversity and Inclusive Initiative. Despite a good time had by all, Lower Boom and this initiative are still shy of their goal. Fortunately, some of the writers were there, and spoke about the project and what it means to them. Lower Boom is trying one more time to see if they can garner support in Portland for Portland Dark. They are asking for your help to raise $5000 by this Friday, November 9th. Your tax-deductible donation will go to help pay for stipends to the writers, as well as kick off Phase 2 of the project: A short film set in the world of Portland Dark, which will premiere February 10th at the Hollywood Theatre. In addition to that, a % of your donation goes directly to the Hollywood Theatre, so you are supporting that Portland icon as well. There is no minimum, and every donation helps – and remember it’s tax deductible.